When I was in college I was president of a student organization that brought in various speakers to address topics of interest in the humanities. My senior year we had read an essay by the theologian that you may have heard me mention from time to time, Stanley Hauerwas. I still enjoy Hauerwas’ work, and appreciate the fact that he is an honorary canon theologian at Christchurch Cathedral. At the time I didn’t know that much about the theological landscape and so had no idea when I contacted him at his office at Duke University that his schedule was booked up for appearances and speaking engagements a year or two out. As I’ve been reflecting upon this Gospel passage during the week, those words have continued to present themselves in my mind. “If you find a temple that needs to be cleansed, cleanse it!” Jesus having performed a miracle at the wedding and Cana of Galilee, and having gone through Capernaum, goes up to Jerusalem. While there, being a pious Jew, he goes to the temple to worship. 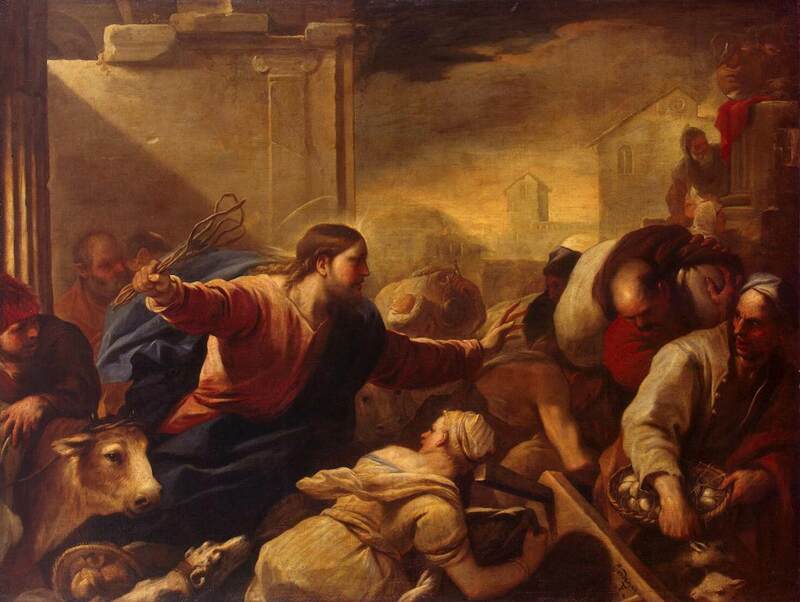 And upon entering he sees something going on that so angers him – a cold calculating sort of anger – that he goes and makes a whip of cords, a scourge, and returns to the Temple and drives out those people selling livestock for sacrifices, those selling doves, and the money changers. He uses the web to drive the cattle, he overturns the table of the money lenders, and pours their coins out on the ground in the temple courtyard. Then, turning to those standing there, he says don’t make my father’s house a marketplace. This event in the earthly ministry of Jesus, has been one that has evoked a great deal of comment. It’s one of the few places recorded in the Gospels were Jesus gets angry. There are a couple more he gets frustrated, or at least were his actions could be interpreted as frustration. But this event stands out starkly as the clearest example we have of Jesus’s anger. And it is an ambiguous event in some ways because people have wondered what was Jesus so angry about? As has been pointed out by commentators both ancient and modern, the money changers and those who are selling livestock and those for sacrifices were not doing anything that in themselves was evil or sinful. I mean, it’s pretty natural. You have a need to offer a particular sort of sacrifice, and rather than hope that there is a lamb or calf without blemish or that fits the other requirements in your flock or heard that year, and rather than bring this animal with you all the way to Jerusalem, why not simply by an animal that fits the criteria at the point where you need it. These folks were providing a service. Likewise with the money changers, if you’re going to the Temple and you are going to offer a monetary gift, the last thing you’d want is to offer a Roman coin with a big graven image of the Emperor with the words “The God, Caesar Augustus” or some such. It would have been blasphemous. So the money changers offered the opportunity to exchange this blasphemous currency for something known as the Tyrian shekel, a coin that’s rather than an image of any person, had an image of wheat. Some commentators have been wondering what it is that causes Jesus to become so angry at these people. Weren’t they simply providing a necessary service? Well, I think the phrasing used by Jesus in the synoptic Gospels is instructive. In John’s Gospel Jesus says “do not make my father’s house a marketplace.” In the synoptic Gospels he’s even more clear and to the point: “do not make my father’s house a den of thieves” (Cf. Luke 19:46, Matthew 21:13). Jesus’ concern does not seem to be that these things are occurring in the Temple in and of themselves. Rather Jesus’s concern seems to be what people’s focus was. The temple was to be the place for people came to worship God. The sellers of sacrificial animals and the money changers, however in turning the Temple from a place of worship into a marketplace had transitioned from enabling worshipers, to actually impeding worship. In other words, their focus was not to ensure that people were able to worship God, but rather, they were concerned with their profit. And there is an intimation that perhaps they weren’t only concerned with their welfare, but that they were perhaps taking advantage of others. Much as the tax collectors of the day made their living by collecting as much as they could over and above the amount they were required to send on to Rome. It seems that rather than making a fair wage, those engaged in selling in the Temple, were taking advantage of others. This seems to be why Jesus says in the Synoptics, “stop making my father’s house a den of thieves!” These folks were inserting themselves between worshipers and God. They were thinking of themselves and not others, and people believed that they had to go through them to get to God. And so, when we look at it from this perspective Jesus’s actions make perfect sense and are in keeping with the frustration he expresses at the Pharisees among others who presume to put themselves between people and God. Jesus is concerned, is that people be able to have a relationship with God. When Jesus is asked by those who witnessed his actions, “give us a signed as to why you do this” Jesus responds by telling them destroy this temple and in three days I will rebuild it. Well of course, his questioners think this answer is absurd. The temple has been under construction for 46 years they point out. But as the disciples understood when looking back from the post-resurrection context, Jesus was talking about himself and not the building of the temple. In this statement Jesus is making a claim about where the presence of God is to be found. The presence of God is no longer to be found in the temple, but rather in Jesus himself. This is the radical claim that separates Jesus from other critics of the Temple at the time. None of them would have claimed that God was uniquely present in them. But this is precisely what Jesus is saying. We must be careful here, because of the fraught history of Gentile Christian interpretation of this passage, filled as it is with examples of the denigration of Judaism, discussion of how the sacrificial system was backward and has been supplanted etc. So to be clear, what is being discussed here is the movement of the holiness of God, the presence of God, the Shekinah, from the Temple to another place. This is not something that is foreign to Judaism. It is instead discussed as something that has happened multiple times. When the Israelites wandered in the wilderness the presence of God was with them in the pillar of cloud and later in the tabernacle (the tent) which served as a precursor of the great temple in Jerusalem. Within Judaism itself there has been an ongoing concept of the idea that God’s glory, God’s holiness, the Shekinah can move. After the destruction of the first Temple, this was the understanding that explained the distraction. Jews came to see the destruction of their temple as evidence of the fact that God’s holiness had left the building so to speak. And it was the absence of God’s holiness that explained the destruction. There were rabbinic stories–the inheritors of the Pharisees–which explained the destruction of the second Temple in similar ways. One of the most moving stories told to me by the Rabbi that taught the history of Judaism course I took in college, was of the chief priest during the destruction of the Temple by the Romans who climbed to the pinnacle with the keys to the holy of holies and threw them up into the air and as a hand–a divine hand–appeared and grabbed the keys, pulling them up into the sky. All this is to say the notion that God’s holiness can move is not something unique to Christianity. Indeed to the degree that is present in Christianity it is part of the shared inheritance that Christians have with modern-day Jewish believers. What is unique about the Christian claim is about where God’s holiness now resides. For Christians the claim is that God is uniquely present in Jesus Christ. And through Jesus Christ, that God is uniquely present in each believer and present in the world through the body of Christ, the people of God. Us in Christ, Christ in us. So Jesus, in cleansing the temple, is not doing so out of a sense that this is the only place that people could possibly worship God. Indeed in John’s Gospel you’ll recall, Jesus encounters a Samaritan woman and has an exchange with her in which he says the time is coming and now is when true worshipers will not worship on this mountain (Gerizim) nor in Jerusalem but will worship in spirit and in truth; for such the father seeks to worship him (paraphrase of John 4:21-23). So the problem was not that folks were defiling the Temple in some way, except insofar as they were inserting themselves between God and the people who came to the temple to connect with God. And so Jesus cleanses the Temple. We likewise are called to cleanse temples. We are called to rid ourselves and our communities of anything that prevents us or others from having relationship with God. If we find a temple that needs cleansing, we ought to cleanse it! But since we are now worshiping God in spirit and in truth, and there is not a particular place where we say we are in closer proximity to God than others per se, then we are called to look not only to our communities but within ourselves to determine what sort of cleansing needs to take place. As the early biblical commentator Origen put it, “When are there not some money changers sitting who need the strokes of the scourge Jesus made of small cords, and dealers in small coin who require to have their money poured out and their tables overturned? When are there not those who are inclined to merchandise, but need to be held to the plow and the oxen, that having put their hand to it and not turning round to the things behind them, they may be fit for the kingdom of God?” (Origen, “Commentary on John,” Ante-Nicene Fathers, 393 to 394). If you find a temple that needs cleansing, cleanse it! Lent is the perfect time to discuss the cleansing of our temples. We’re all temples of the Holy Spirit; what in our lives is getting in the way of our faithfulness? Of our relationship with the father? Picking up on Augustine’s metaphor, could we not lay out for ourselves the cords of our sins, and making a weapon of them, cleanse our hearts, casting them out and reorienting ourselves toward God? If we want to talk about what this means, I think this could be seen as a metaphorical representation of the process of confession and absolution. When we confess – and even during this general confession that we have in our services, I hope that we’re all thinking about particular sins which are separating us from God and one another – we are laying out before us the cords that could be turned into rope. But the very act of remembering, of calling the sins to mind, helps to deprive them of their power and in turn gives us the opportunity to once again be faithful. Lent is a time of introspection and reflection. Perhaps we should put this active, if violent, imagery to work and understand that when we confess, when we pray, when we ask for forgiveness – these are the tools with which we can run off the things that separate us from God. And if we want to temper the aggressiveness or violence of this imagery a bit, we can do so by considering the fact that this action is not taken in order to make us worthy of God, or of forgiveness. It is rather taken, out of gratitude for the forgiveness already received, for the reconciliation already achieved. In seminary I had a T-shirt that had a slogan on it that amused some of my class mates, and I know that one Episcopalian theologian, Paul Zahl, also had this T-shirt. It said “I bring nothing to the table.” The reality of that slogan is that there is nothing that you or I can do to win God’s favor, or to earn our salvation. But out of gratitude for what God has done in my life, I can reflect upon the ways and I have fallen short of the great gift I have been given, and I can seek to live a holier and more faithful life, a life where I am more closely identified with Jesus. And so as we come to this table–this altar–today let us recognize that we bring nothing with us with which to purchase the grace of God. Instead we come to this table and receive the grace of God, and having been bought by it, enabled to cleanse ourselves and be more like Christ, not out of necessity but out of gratitude. Amen.